In order to attract valuable, on-target views of your job postings, you spend a lot of time and money on talent acquisition tactics. Primarily among these tactics are pay-per-click strategies that include banners, search engine marketing, social ads and the like. We love PPC (an its cousin SEM, or search engine marketing) because it generally gets the job done – you spend the cash, and the traffic shows up. But this traffic is ephemeral. The second you stop paying, the traffic goes someplace else. That’s why you also need to invest in search engine optimization services. SEO has a long tail that stretches far longer than anything PPC can deliver. PPC and SEO are two very different tools that serve two very different purposes. Nonetheless, they belong together, just like a hammer and chisel, a pretzel and cocktail, and a chair and table. For optimal results, you need to use the two together. Unfortunately, most people don’t understand this. In my mind, I always think of PPC and SEO as the artillery and infantry of talent acquisition marketing. Let’s get this straight: This is a metaphor. In no way do I want to make this anything to do with the military, war or the appropriateness of giving children “violent” toys that absolutely destroy your bare feet when you step on them first thing in the morning. But the metaphor is apt. In military operations, the artillery bombards the enemy from a distance, softening up the resistance as much as possible. Successful artillery depends a great deal on accurate targeting, knowing where your enemy is camped, knowing where they are headed and knowing what kind of environment they are in. A single artillery shot from a distance won’t do a lot of good. You need to spend a lot of time firing over and over again until your enemy has dug in deeply and isn’t interested in moving. The bad news is that artillery is expensive – those shells aren’t cheap and you’re going to have to use a lot of them to get any work done. Does this scenario sound like PPC to you, too? 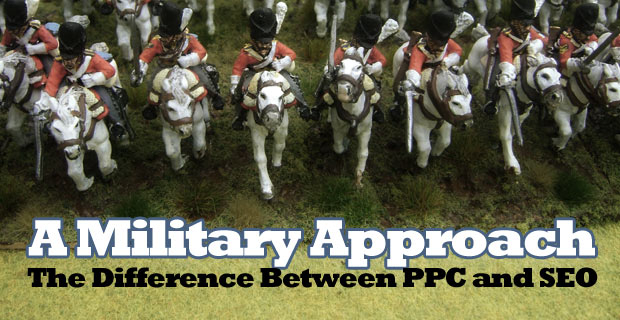 Like artillery, PPC requires targeting, lots of money and relentless repetition. That’s how PPC works: No single ad does a great deal of good, but if sent over and over, it can drive a great deal of value. In stark contrast to the artillery is the infantry. While the artillery softens the resistance from afar, the infantry boldly storms the beach. Essentially, the infantry’s intent is not to strike from a distance, but to claim territory as its own, then defend that territory and expand it. Territory is a funny thing – no one’s making more of it. So when you hold it, not only do you derive its value, but you also keep others from reaping the benefits of that same value. Now think of Google as a territory. When you rank for a search term in Google, someone else cannot. That’s what SEO does: It helps you claim a piece of territory and defend it. Now that you understand the differences between PPC/SEM and SEO, how do these very different tools work together? We take another lesson from green army men (and women). To claim a territory, first you shell the ground in an attempt to scare off and destroy as much of the enemy as possible. Once done, the infantry seizes the land and builds defenses for it. Afterward, the artillery uses this new territory as a home base from which to shell the next strategic space. Online, you spend a bunch of money on ads for a specific target. Those ads point to content that viewers read, enjoy and then share, thus allowing for the creation of multiple new audience spheres. As people continue to click on the content and share it, you begin to own that space outright via SEM. Building more content within that space and optimizing your pages for that space will defend it from new players. You can then take the PPC resources you used to claim this space and reinvest them into procuring the next space. Like a game of Risk, your objective is to advance space by space until you control the region, and eventually, the world. Most people will continue to treat PPC/SEM and SEO as completely separate tactics, therefore forfeiting the benefits that arise from using them together. But you’re not most people – you now understand that these tools perform best when paired together. Now is the time to put this knowledge to good use and take control of the game! It’s time to seriously think about how you can use PPC/SEM and SEO together to dominate the talent acquisition world. Images are from Lord Hill’s recreation of the British Army’s engagement at the Battle of Waterloo in miniature.